Big knit throws, sweaters for hot water bottles, ponchos in solid colours and shawls that are perfect for winter evenings…Pluchi does non-fussy and sophisticated the best. Anyone who’s gone looking for plain-ish stuff will know how difficult it is to find it in regular stores. But at Pluchi, that’s never a problem. These bed throws in muted tones or with an occasional polka, vintage pattern or stars are subtle and cosy enough for afternoon naps. 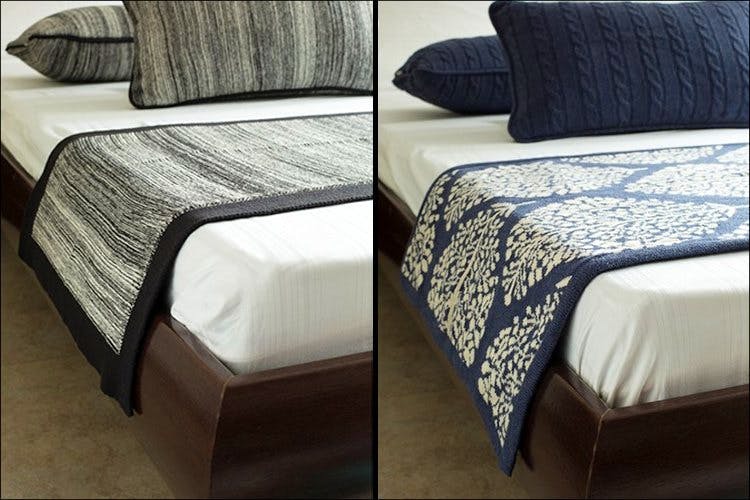 The blankets priced from INR 2,599 also have similar designs and reassure us that our search for understated everything will not be in vain here. If non-dramatic ponchos in classic colours is what you like, the brand has them in varied shapes, sizes and lengths here, along with shawl wraps that are made to keep us all warm at family barbecues. These aside, there’s a whole bunch of baby and mommy stuff to check out. Looking to add basics to your wardrobe or your home? Pluchi’s got your back. Sometimes, the best things in life come without any trippy patterns and blinding colours.